Coins & Currency: Highlights of Skinner February Auction | Skinner Inc.
MARLBOROUGH, MA – January 28, 2019 – Coins and currency are seen not only as a utilitarian tool for commerce but also as miniature works of art. These small sculptures and engravings historically feature gods and goddesses, rulers, and allegorical figures, rendered in an artistic manner. The Skinner February auction, online from February 13-22, of coins and currency highlights some of the most desirable and beautiful of these designs. Among these is a selection of ancient coins, primarily Greek and Roman in origin, that exhibit strong strikes and fantastic surfaces. Highlights include a toned nomos from Metapontum (Lot 2004, Estimate: $800-1,200), depicting Demeter, an ear of barley, and two amphorae. Another Lucanian nomos from the city of Herakleia (Lot 2005, Estimate: $600-800) features the head of Athena wearing a Corinthian helmet decorated with a scylla, the reverse of Herakles with a lion pelt and club. Both of these coins show very little evidence of circulation and wear to the high relief, making these exceptional examples of their types. Lastly is an undated year 3 Judaean sela from the Bar Kokhba Revolt (Lot 2012, Estimate: $4,000-6,000) with the Temple of Jerusalem on the obverse and a lulav and etrog on the reverse. These coins are highly collectible and prized for both their symbolism and rarity as a three-year issue. Fast forward many centuries across the pond to the American 1804 draped bust large cent (Lot 2023, Estimate: $6,000-8,000), offered in a PCGS VF25 holder. With a small mintage of only 96,500 and survival estimates of less than 500, this is one of the keys of series. And although graded a Very Fine, a majority of certified examples are Fine and lower in condition. Paper money highlights include four proposed 1880s Colombian Banco de la Republica banknotes (Lots 2176, 2177, 2178, 2179), produced by the Homer Lee Bank Note Company. These notes, the 1, 2, 5, and 10 pesos, each exhibit intricately engraved vignettes and three with portraits of George Washington. 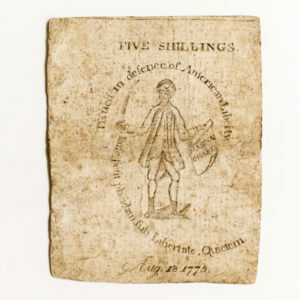 Massachusetts August 18, 1775 5 Shillings, MA-162, a well circulated example of a Revere “Sword in Hand” note. Three local colonial issues from Massachusetts also inhabit the sale: an August 18, 1775 “Sword in Hand” 5 shillings (Lot 2158, Estimate: $200-300), a December 7, 1775 “Sword in Hand” contemporary counterfeit 42 shillings (Lot 2159, Esitmate: $200-300), and an October 16, 1778 “Codfish” 9 pence (Lot 2160, Estimate: $100-200), all engraved by Paul Revere. This auction will be held online only. 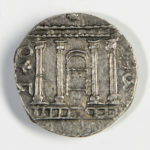 It offers an excellent opportunity to bid at leisure and to acquire items of numismatic interest and importance from a leading auction house of impeccable reputation. Auction open for bidding February 13 – February 22. Previews at Skinner’s Marlborough gallery, 274 Cedar Hill Street, February 19, 12PM to 5 PM; February 20, 12PM to 7PM; February 21, 10AM to 5 PM. Free and open to the public, specialists will be on hand to answer questions. 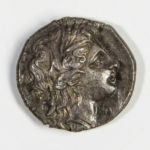 This entry was posted in News and tagged ancient coins, ancient currency, antique coins, antique currency, circulated coins, coins, collectible coins, currency, Greek coins, old coins, rare coins, Roman coins by Kerry Shrives. Bookmark the permalink.